If you are in need of a high-quality trailer but don’t want to buy one, that’s not a problem for us! At B.H. Trailers and Plows, we offer trailer rentals to help you accomplish all your hauling needs at half the cost! All forms MUST be signed by the person picking the trailer up. Tow vehicles MUST be an adequate size for the trailer. All vehicles pulling a trailer with electric brakes MUST have a brake controller installed. Drivers picking up the trailer must have a valid driver’s license & insurance card. 24-hour advance notification for reservation with a deposit. Cash, checks, debit cards, money orders, or pre-loaded debit cards won’t be accepted. Renters must declare what is being hauled and a total weight of items being hauled. At B.H. Trailers and Plows, we offer customers a number of options when it comes to renting a trailer. Along with our rental trailers, we offer daily and weekly rental rates. That’s right, at our company we offer rental services available up to seven days, all at prices you can afford. Single day rentals maybe picked up at 8am and must be returned by 5:30pm the same day, Weekend rentals maybe picked up Fri afternoon and must be returned by 9am Monday, Weekly rentals maybe picked up at 8am and must be returned 7 days later by 5:30 pm. B.H. 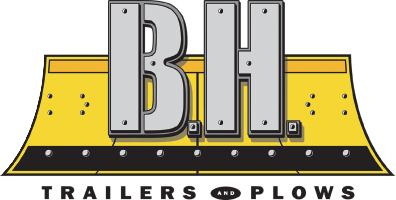 Trailers and Plows wants to match all your trailer needs whether you are purchasing or just renting. 77”x18 Equipment trailer 8000lb payload standup ramps (superior) $85 per day, or $145 for a weekend, or $445 per week.